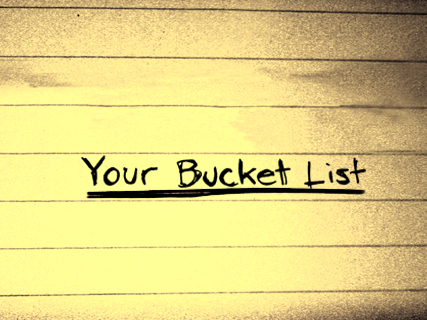 Most of you have all heard about the concept of having a ‘bucket list’ or, rather, a personal list of all the goals you want to achieve, dreams you want to fulfill and life-experiences you wish to have before you ‘kick the bucket’. I think that everyone should have some sort of list like this, whether it’s written down, emailed to your i-phone, or just simply in that noggin of yours somewhere. Having such a list allows us to be held accountable for what we want to achieve, see and do in our lives, helping us to maximize every moment we have and live life to the fullest. 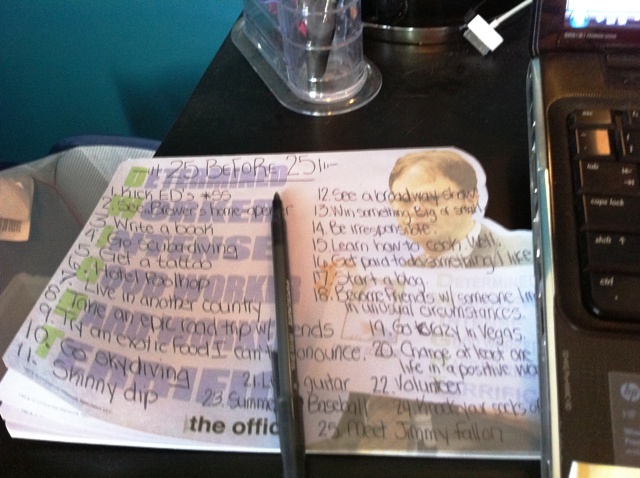 My bucket list is a mile and a half long, filled with things like “Write and publish a book” (check! ), “Kiss somebody in the rain” (super cheesy, I know. I blame Nicholas Sparks), “See a baseball game at every stadium in America”, “Eat my way through Italy”, “See New York at Christmas time (double check! )”, “Run a marathon” (that’s run a marathon, not watch a marathon of Seinfeld because let’s face it, I do that every weekend), “Send a message in a bottle” and “Make a positive difference in someone’s life.” The thing about this bucket list is that each and every item is completely do-able and is a sort of stepping stone for me to go out and make these things actually come to fruition. Slowly but surely, I hope to cross off each and every item, bringing with them unbelievable experiences and incredible memories. 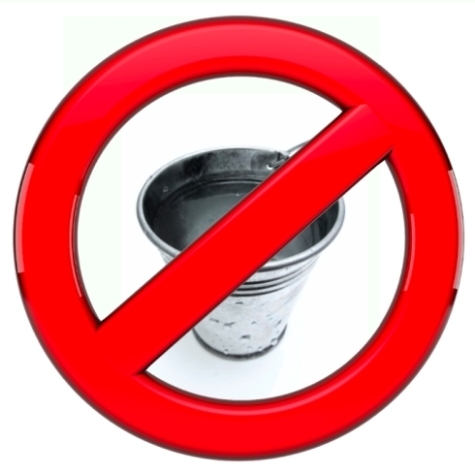 Along with my ‘bucket list’, I also have another list, one that I would like to call my “Stay in the bucket list.” This list is full of items that I hope I don’t ever have to do, see, hear or experience in my lifetime (again). After all, life is just too short to repeat what didn’t work for you the first time, right? Yeah…that can just stay in there. 1. Drive my manual VW Bug (or any stick shift vehicle for that matter) through the hella-hilly streets of San Francisco. My stick shift and hills are most definitely not on good speaking terms…nor do I think they will ever be. 4. Wear apparel, cheer for or have any positive affiliations with the Chicago Cubs. 6. Attend a kiddo’s birthday party at Chucky Cheese. Oh who am I kidding. I totally would because pizza. And singing/dancing mice. 7. Attempt to curl my hair. Or cut my hair. Or straighten my hair without the help of a pro. No, it’s not rocket science but…well, for me, it kind of is. 8. Attempt actual rocket science. 9. Go ice fishing. Sorry dad, but I just don’t see the point of sitting in sub-zero temperatures for hours on end, freezing your hat off, just waiting for a fish that will most likely never even attempt to take your bait because they, unlike us, don’t want to risk getting frostbite and hypothermia. In fact, I bet they all get a good laugh, watching us from below wondering what in the world we’re thinking. 11. Go into a bookstore and leave without buying anything. It’s not that I don’t want to do this, but more like it’s physically impossible for me to do so. 13. Mistake salt for sugar on my spaghetti. 14. Go for a run in my new kicks through a dog park. The poo-to-shoe probabilities are just way too high. 15. Listen to country music. 16. Drive through Nebraska. Or Kansas. Or Oklahoma any time between March – October. I didn’t like the movie Twister and I certainly don’t want to be in a live-action version of it. 17. Not do something just because I’m afraid. 18. Or let the opinions of others cause me change who I am. 19. Ever doubt the positive power of a cookie. 20. AND FOR THE LOVE OF RUNAWAY CARS, I WILL NEVER, EVERRRRR FORGET TO PUT MY PARKING BREAK UP. AGAIN. EVERRRRR. This was a just a snippet of some of the things I don’t want to do before I kick the bucket, and I’m sure that as I learn and experience new things, yet another item will be tacked on to this list. Although both lists can be beneficial, it’s important to balance both what’s in, and what isn’t, in your bucket to ensure that you have a great day and an even better tomorrow. So what are you waiting for? Start crossing those items off (or keeping them on, especially if it involves eating fishy squid while listening to country music on your road trip through Oklahoma. I am turning into an old lady. In a mere month and 13 days, I will be 25. Yikes! How did that happen?! It is crazy to think that I will be a quarter of a century old; that’s five whole hands! When I was a young girl, I thought that 25 was, “like, so old!” However, now that I am actually that, “like, so old”, I have a slightly different view on things. Yes, I am going to be 25, and yes I have experienced and lived through a whole bunch-a-crunch of things, but there is oh SO much more that I get to look forward to, 25 and beyond–Buzz Lightyear style. Before I get too ahead of myself, I want to go back to my pre-25’s for a bit. A warning that I ignored from my much older and wiser counterparts (thank you mom, grandma, Professor Biggerstaff and Oprah, among others) is that life goes by fast. Way too fast. It gets pretty easy to get caught up in all of the craziness, the hustle and bustle’s of work/responsibilities/stress/plans and forget to be young and crazy. I am only young once after all. I wanted to make sure that I did everything and anything (with the exception of anything Prison-Break worthy) that a young and crazy girl should do. A few years ago, I made a list. This list, initially scrawled out on a Dwight notepad, was a list of things that I wanted to do, see, accomplish, finish, eat and/or hear before I turned the big 2-5. It was a mini-me of my bucket list. A list to motivate me, to stretch my boundaries, to excite me and to make me look back on one day and say to myself, “What was I thinking?! while at the same time saying to myself, “Man, that was AWESOME!” I have been lucky enough to have crossed off many of these items; some are still a work in progress and some I may have to slide over into the list of ’26 Before 26′. I love the whole idea of these kinds of lists; not only do they take me out of my comfort zone a bit and expose me to new and exciting things, but they make those years that seem to go by so fast stretch a whole lot longer by turning them into unbelievable memories you can have now, and 25 years from now. 2. 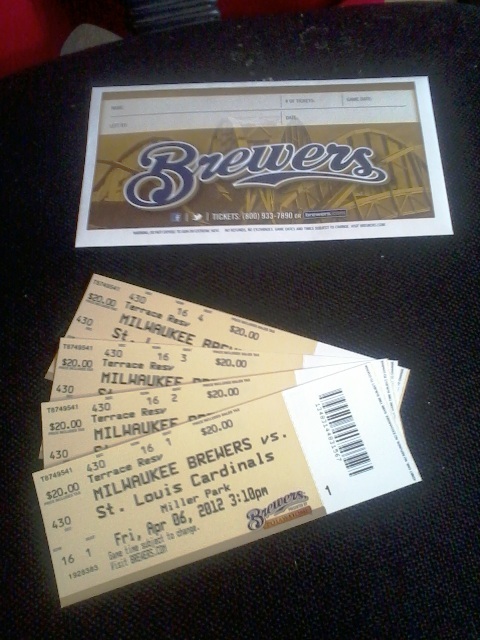 See a Milwaukee Brewer’s home-opener. Come April 6th, 2012 (just 32 days from now), I can officially place a big fat check mark here! Chris Becker, you better be ready, my friend! It is going to be EPIC! It’s hard to believe it, but I did it. I actually wrote a book. A whole book! Mark Twain, you betta watch yo back, mister 😉 Things are just in the beginning stages of the publication process right now, but I can’t wait to share with you, with the world, my written voice (beyond the ramblings here of course). Two years a go, my family and I grabbed our sunblock, swimsuits and flip-flops and made our way to Key West for an amazing family vaca. It was here that I had the BEST Key Lime pie ever, almost stepped on a jelly fish, AND went scuba diving! If you have never explored the scuba mask in tow, I highly suggest you do it! There is something so peaceful and surreal about life under the sea that you can’t quite describe…although my friend Sebastian does a pretty good job at it. Check. MAJOR ouch. But MAJOR cool! If you are ever bored and looking for a cheap and exhilarating way to have some fun, I dare you to try hotel pool hopping (although as a side note, I am not sure if this is legal or not. As another side note, if it is not and you happen to get caught following my silly advice, I will NOT pay for your bail money.) Basically, you pretend to be a guest at a hotel (May I recommend The Holiday Inn? Not only are the staff there usually uber nice and more likely to not take a second glance when you take a cannon ball into their (quite spacious I might add) pool, but they serve free cookies from 3-6pm. SCORE!) and swim, swim, swim. Because sometimes you just need to get your chlorine fix, ya know? Sadly I haven’t even been out of the country, let a lone live in one for a bit ,but I am doing everything I can to change that. As soon as I find the time. And money. And a partner in crime to go with me. 9. Try an exotic food. 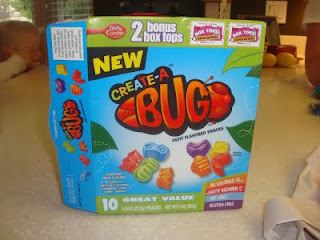 Do bugs count? My dad promised me he would take me for my 16th birthday. 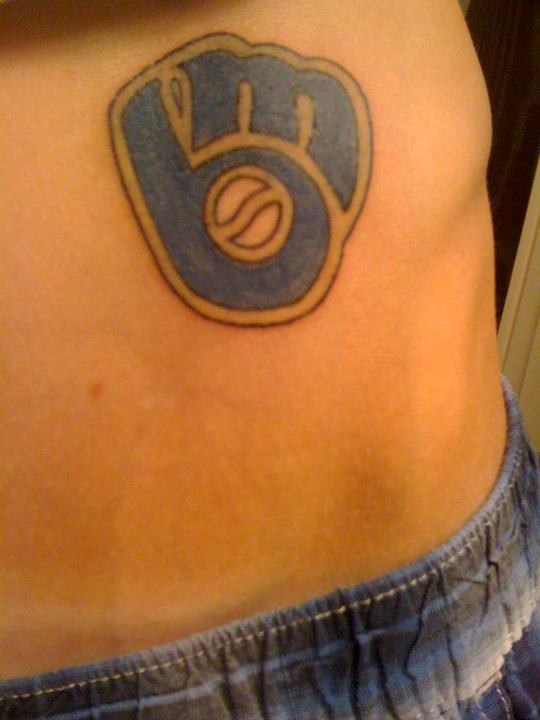 Which turned into my 18th birthday. Which turned into taking me on my 21st birthday. I am beginning to think he doesn’t want to jump out of an airplane. For my 25th birthday, I AM GOING SKYDIVING! And I am not talking about dunking a Dorito into some guacamole. ‘Nuff said. Or should I say, [in the]’Buff said. 12. See a Broadway show. On Broadway. 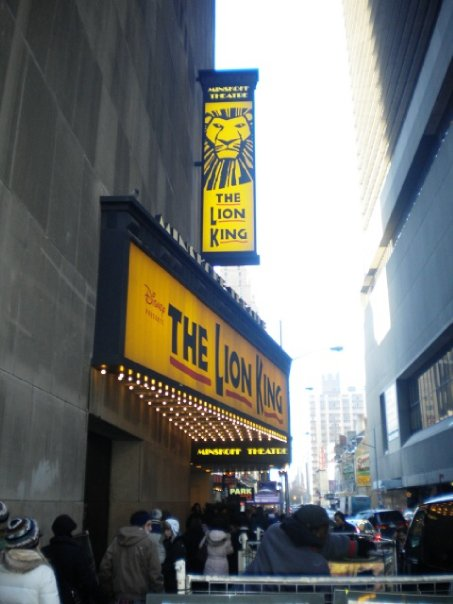 I went and saw The Lion King two years ago in NYC and OMgoodness! AMAZING! It is incredible the amount of talent that those actors/singers/dancers have! Incredible! 13. Win something. Big or small. I usually eat my Lucky Charms, bowl half-full. You see, for some reason I have the best luck winning things that are completely random and a bit on the wonky side (i.e. a Walkman in fifth grade at a D.A.R.E conference–right after I had just bought a Walkman myself, free bologna for a year–an Oscar Myer’s ad contest I entered when I was 14, a water bottle that smelled like feet, and tickets to a band I had never heard of, among other things). You know what I really want to win? A box of Lucky Charms with just the marshmallows! How sweet (pun intended) would that be?! Because sometimes you just need to be. I think many of the items on this list alone qualify me to check this off as well. 15. Learn how to cook. Well. Paula Deen or Rachael Ray I am not, but I have learned a thing or two from them. I think I might just have to work a bit more on the whole ‘well’ part of the equation. 16. Get paid to do something I love. Isn’t that the goal?To not only do something that you are good at and that you are qualified for, but also that you enjoy. I was able to spend a short time doing this very thing and although it was for a short while, I learned a lot. Not only about the nature of the work and the professional world, but more importantly, of myself. It was because of that experience that I now am going after something that I have always wanted to do, that one thing that I will get paid for doing something I love. I hope all of you can find that sometime, somewhere. 18. become friends with someone in an unusual circumstance. 19. Go crazy in Vegas. 20.Change at least on person’s life in a positive way. If I had just one wish, it would be that I could, in some way, affect someone’s life for the better. To help them, to guide them, to give them inspiration and hope. To listen, to offer support, to make them pee their pants laughing (and then to be there with an extra pair of pants.) I hope I have done these things many a time over, but even if I have and this item is gets crossed off, I will forever be striving to add another check mark here, always looking for that next opportunity to help someone who needs it, and wants it, most. 21. Learn how to play guitar. I’ve always wanted to learn how to play an instrument (besides the recorder–which I am mad-good at btw, and the choppy chopsticks on the piano). It’s high time I channel my inner Richy Sambora and learn how to rock. Relay for Life, The Wisconsin Humane Society, tutoring. All of these things I LOVE spending time doing but I am always on the look out for the next great opportunity to give my time, love and support to. This I have yet to accomplish but on my Eggo Waffle, it will be done. Oh yes, it will be done. One summer, maybe this, maybe next, traveling around this great country of ours, taking in a game at EVERY baseball stadium im America. Talk about a home run of a time! Maybe he could help me check off #24, kill birds with two stones? I’ve got quite of my list crossed off, but hakuna matata if I don’t cross off all of them before the big 2-5 arrives. That just means I will have an even more crazy, fun and amazing list of things I want to do, see, accomplish, finish, eat and/or hear before I turned the big 2-6. 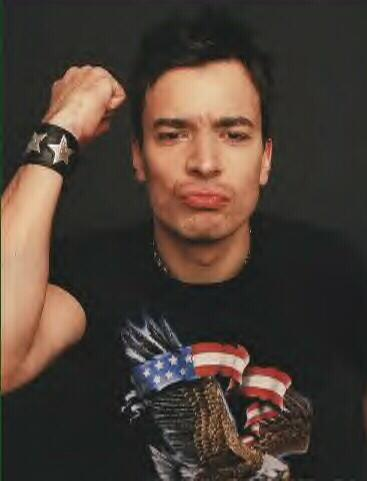 And on that note, I am off to finish writing my romantic love note to one Mr. Jimmy Fallon. What do you think? Dotting my i’s with hearts a bit much? Have a great rest of your night guys! And if you haven’t done so yet, start crossing off your items!